Hi, how do I use FlipMap? How do I animate the trigger pickup without using OCB 64 and using OCB 4? when does Lara get a key over something using OCB 4 does a cutsene happen? Also take it easy and don't run before you can walk, it is a lot of info and we all had to go through it. Do I need to use a specific version of NGLE or NG_tom2pc? Seems I have managed to solve the problem - turns out I wasn't applying all required patches in TREP after all. I didn't apply the "remap scene memory" patch, because the annotation said it was for fixing high-DD crashes, so I somehow assumed it didn't have much to do with objects, but once I activated it I could also check "increase statics limit" patch, which I think resolved the issue and now the level built with the Northern Legends WAD loads fine. Does anybody know how to create a shortcut to tomb exe which will work on every computer when downloaded? Then save file and change extension. This is the shortcut for any computer as long as it is in game folder. I've tried on my own and am having some trouble. The inside portion of these structures is a separate room, correct? My trouble is coming from trying to shape that "inner room," my attempts seem to all result in just making the "exterior" of the pyramid. If anyone has suggestions or know some source on how to make these it would be appreciated! The inside portion of these structures is a separate room, correct? No. Incorrect, as a matter of fact. The pyramids are not separate rooms, in fact only two rooms are shown in the screenshot: the one containing the pyramids, and the one you can see through them below. The pyramids are made from raised triangular floor sectors in the upper room; there is, technically speaking, no inside, because there are no faces on the inside, so the exterior is all you get to work with. If you want to create the illusion of interior faces (or ‘texture the interior’), you’ll need to apply your textures on the exterior faces with the ‘double-sided’ (and ‘transparent’) modes activated, as you would with a water surface. 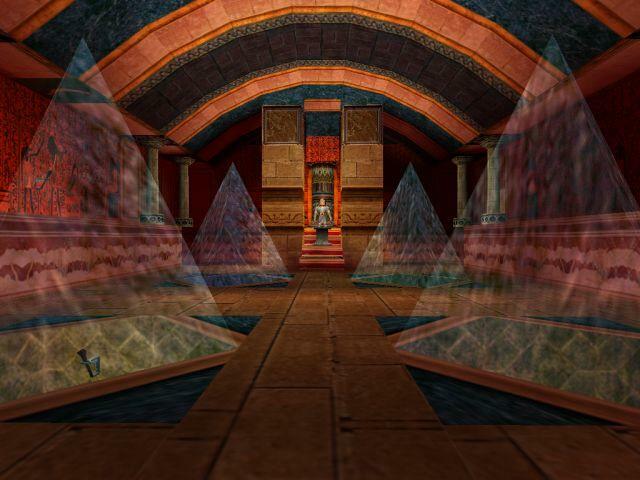 Any texture on the floor of such a pyramid needs to be on a portal to the room below, so in order to have a face there for you to texture, that portal must have Toggle Opacity activated as well. (Obviously, you’ll have to texture this one from the room below). This could not be more obscure to me had you written it in Greek. My legal briefs would probably have the same effect on you. Then again, those are intended to obfuscate. Ὅλον δέ ἐστιν τὸ ἔχον ἀρχὴν καὶ μέσον καὶ τελευτήν, as Aristotle once said. Next time I’ll try and make the argument more relatable for you by referencing the relevant sections of the Manual by page and paragraph numbers. Or by adding some small print at the end of the post which negates everything I ostensibly claimed in regular-sized print. I guess ‘obfuscate’ is the operative word here, isn’t it. This was the part that had me struggling! I didn't realize on which plane the floor of this pyramid was supposed to go, so my early efforts ended up with a black "untextured" floor. This helped clear it up and I have it working. Thank you, Mulf. Guys which TREP patch is the inventory background color? Not speaking about custom images, just the solid color. EDIT Nvm found it, "Clear background images". Instead, how do I use TREP enemy patcher to make the mutant mortal? I tried the blood flag with 150 HP but I get the "idle mutant" error. I mean that state when he stops attacking / being targetted but doesn't die. EDIT Found it. I had to apply the extra "exploding enemies" patch. And set all 5 slots to 63 since no other enemy in this game explodes. as follows it keeps aero v-sync and prevents screen tearing which would otherwise occur. If you build with TREP you should always, always use it. I know I should apply "toggle opacity" in flipped room and it works if I try it without water, but with water Lara just falls through the texture. Am I doing something wrong or it can't be done at all? This is why Core made that one-click deep room in between, in the TR4 level where you poor that stuff into the water and the floor becomes solid below that one click water. You could try makign the water room a mist room, so the water reflection effect is in it, but it is in fact a dry room. That way it creates the illusion of it still being water?